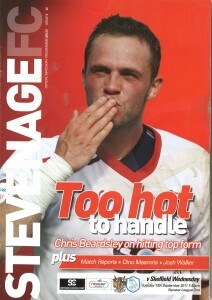 Following Stevenage’s promotion to League 1, the mood of the Boro faithful was optimistic, although many pundits and football write-ups had written the team off as favourites for relegation straight back to League 2. When the fixtures for the new season were released, Boro’s first few matches were against familiar foes such as Exeter and Chesterfield -although one fixture which stood out early in the season was the visit of ex premiership side Sheffield Wednesday to the Lamex. 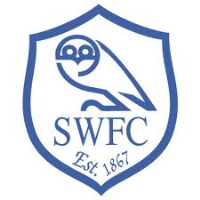 Many fans will remember the glory days of Sheffield Wednesday, some of their big name players, their cup runs and memorable games in the Premier League. Only a few years previous, the Owls were playing at the highest levels, competing for trophies with the biggest names in English League Football. 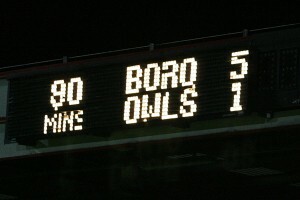 This truly was to be Boro’s first big test in League 1 – and what happened that night made headlines in sports papers the following morning and represents one of the most memorable Boro matches to date. As the game kicked off, with Boro shooting towards the North terrace, the home side showed the early initiative and signalled their intentions with decent attempts from Bostwick, Long and Mousinho. In the sixth minute, a trademark Bostwick shot from range was spilled by the Owls keeper O’Donnell and followed up by Craig Reid with a sliding finish, sweeping the ball into the roof of the net from 6 yards out to give Boro an early lead. Four minutes later, the lead was doubled, courtesy of a driving finish from John Mousinho, as he latched onto a pass from Darius Charles on the edge of the penalty area and fired into the bottom corner. The shell-shocked Owls responded with some off-target attempts, before Bostwick stunned them in the 17th minute with a seemingly mishit shot from distance that flew into the bottom corner off the inside of the post. The home fans were as stunned as the away fans – and despite having a three goal lead at that point, it could easily have been more. It was unbelievable for many home fans given that prestige of the opposition, and nobody believed that the rout would stop at three. Again, Sheffield continued to create chances for themselves, but were unable to breach the Boro back line, with Ashton, Roberts and Day all nullifying the Sheffield threat. 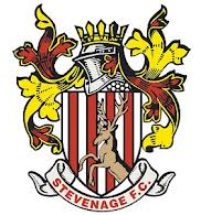 As the end of the first half approached, Stevenage added to their tally with a fourth goal, courtesy of a fortunate finish from Lawrie Wilson, scuffing a fast crossed ball goalwards and watching as it floated past the hapless keeper to make it four. At the restart, the Owls made a number of substitutions in an attempt to regain some control over the match, with Prutton, Jones and Bennett making way for O’Connor, R Johnson and J Johnson. The changes seemed to steady the ship a little, as the start of the second half was much more contained with less goal scoring opportunities. However, not content with a four goal lead, Boro continued to press and had plenty of possession in the second half, before making some substitutions of their own, with Mousinho and Long being replaced with Josh Walker and Jennison Myrie-Williams respectively. The change made an immediate impact, as Boro went 5-0 up a minute later, courtesy of some fancy footwork from Darius Charles, as he twisted past two defenders in the box and slotted the ball into the bottom corner. They were rewarded a few minutes later as the Owls grabbed a consolation goal, with Gary Madine capitalising on some defensive uncertainty to beat Chris Day from close range. 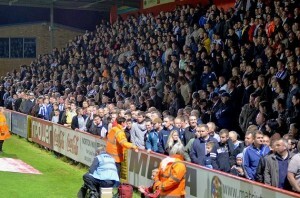 The rapturous applause from the away end was a comedy moment to cap an amazing night. Following the goal, Boro made their third substitution of the night, bringing in Phil Edwards as additional defensive cover, in place of front-man Craig Reid. 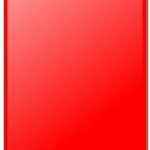 Both sides continued to make chances, before the Owls misfortunes were made even worse as they were reduced to ten men – substitute Jermaine Johnson being red carded for violent conduct on Scott Laird in the 87th minute. The whistle blew after 4 minutes of added time, signalling a memorable Boro victory and a clear statement of intent from the league one newcomers. Interestingly, Sheffield Wednesday became Stevenage’s biggest fans later that season, as the two Sheffield clubs battled it out for an automatic promotion placing. 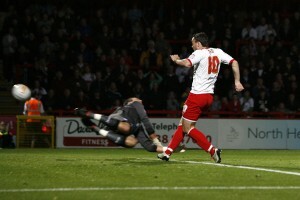 The Hertfordshire side themselves faced Sheffield United in a must win match for the Blades. A match that ended 2-2 at Bramall Lane, and saw United drop key points and narrowly miss out on the final automatic spot to local rivals Wednesday.